Silicone gel breast implants are now mainstream and account for at least half of all breast augmentation surgeries. 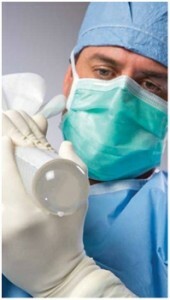 What is new, however, is a recently developed device that is used to insert silicone implants called the Keller Funnel. Until the development of this device, putting in a silicone implant was like trying to push a water balloon through a buttonhole… it could be done, but it was always a struggle putting in the prefilled silicone implant through a small incision. With the Keller Funnel, the implant can be placed through an even smaller incision with much less trauma to the surrounding tissue or to the implant. This gentler method of placing the implant also facilitates “the no touch technique,” which is believed to decrease the incidence of capsular contracture, the most common complication of breast augmentation surgery. I have been using the device for several months now and only wish I had come up with the idea myself!